Adam Smith's theory of division of labor tells us: for areas where you are not good at, such as the VPNs, let professional people do it for you. Are you going to China (or other countries with cyber censorship)? you are recommended to prepare a VPN service firstly before you go, no matter what you are planning to do in China: working, studying, business or traveling.
. the first reason is that you can not visit many useful websites in China, such as Google, Gmail, youtube, GitHub, Twitter, Instagram and even your government websites, too many websites that I cannot list all are blocked by China. Most Chinese uses baidu.com to search online, but let me tell you that Baidu just is a rubbish compared to Google.
. do you care your online privacy? this is not about China but all the world, that companies or governments are collecting your personal information without your notification, because they just want to know more about you so that they can make more money from you, by selling your products/services, or by cheating you. In China, a vpn is not luxury but necessary, a good VPN can greatly improve your privacy and security online, reducing your information being collected, never believe that some VPNs providers claim that they can make you anonymous because nothing will be absolutely anonymous on the web. 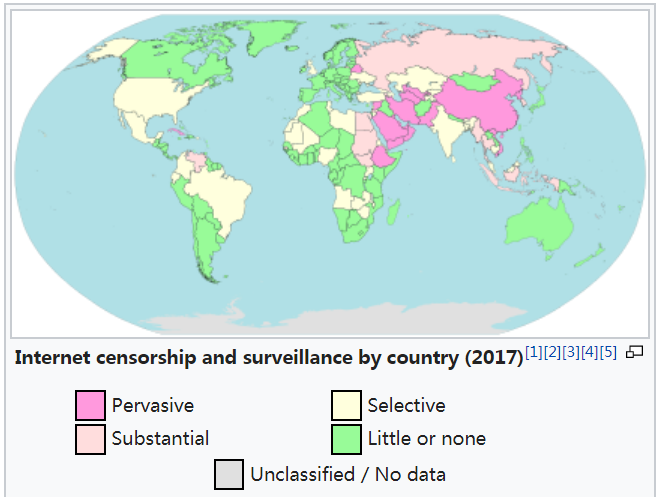 Internet censorship is a worldwide government behavior, not only in China, but especially in China, it exists everywhere on this planet~Asia, Europe, America and Africa, not including Antarctica. image via Wikipedia.
. Then how about using free VPN? No, free VPN is not recommended! It is not that these paid VPNs will not be blocked by China's Great Fire Wall, but that these companies will promptly take action after their services are sealed, add new server nodes and change algorithms, etc., to break through the network blockade in a short period of time. Because free is the most expensive on this planet, there is no such thing as a free lunch! The free VPNs usually are not stable and speed slow, so you have to spend a lot of time and effort on searching free VPNs. On the other hand, the free VPN providers perhaps will collect your information, and sell it to a third party, for money, who knows? Yes, if you need a VPN, go to buy one. One simple principle: when you are choosing to buy a paid VPN, choose the one with a good brand, no matter where you are, China or other places. if you want to buy a VPN, why not buy a professional one with a better brand? the top 3 best-paid VPNs (in China and the world), with price discounts register via this page, each of them works perfectly at all the platforms, such as android, ios and windows devices, try to use the VPN you buy in the first days, if you are not satisfied, you can ask for them to give your money back. there are many payment methods you can choose, such as credit card or PayPal. all of these VPNs listed work globally, not only in China, but also in Iran, India, Russia, Singapore, Japan, USA, European, UAE, ..., even in North Korea, as long as you can connect the internet. Tips: Please select and purchase your favorite VPN service according to your needs and preferences. This page is just a brief introduction. Please refer to the VPN provider's website for details. By the way, there will be some discounts for purchasing VPNs through this page. again, no matter where you are, no matter which vpn you buy, make sure you are satisfied with the free trial before you pay, make sure you ask refund if you are not satisfied as soon as possible.
. VyprVPN, a VPN service of Golden Frog, this company is registered in Switzerland, their logo is: Your Data. Our Servers. No third parties. Its Google search introduction: VyprVPN is the world's most powerful VPN with exclusive features, proprietary technology and thousands of users. VyprVPN works in China~~~World Fastest VPN，3 days free trial，3 months free when you buy one year! via this page.
. ExpressVPN, a VPN service headquartered in the British Virgin Islands, a tropical oasis without data retention laws. No activity logs. No connection logs. Some netizens commented that it is by far China's best VPN vendor, and it is also one of the most expensive personal business VPNs. Its Google search introduction: Top rated VPN. Unblock websites & protect all your devices. 24/7 support. VPN for Windows, Mac, Android, iOS, routers & more. Try 30 days risk-free. ExpressVPN works in China~~~High speed, ultra secure, and easy to use. Instant setup. 30-day money-back guarantee.
. NordVPN is a Panama-based VPN service provider, established in year 2008, there are 4200+ servers scattered in 62+ countries around the world, with low prices, stable performance, and 30-Day Refund Policy, NordVPN Takes the Lead in Global VPN Market, it also becomes very popular in China. With the help of NordVPN, we can easily visit google, gmail, twitter, youtube, instagram and other websites blocked by china gov, it allow us to connect up to 6 devices at the same time, all the platforms of android, ios, windows and linux are supported.
. Private Internet Access, a VPN provider with shy style, what I only can tell you is that PIA VPN belongs to London Trust Media, Inc, that's all, but its VPN service is really very good and cheap, many famous companies such as Lifehacker, MSN, Forbes, Yahoo, Wired all are using its service. Private Internet Access offers you 7-day money back guarantee, besides credit card and PayPal, you even can use Bitcoin to pay your money. Its Google search introduction: High-speed anonymous VPN Service from Private Internet Access. Protect yourself with our secure VPN tunnel. Packages starting at $2.91/mo. Register today. Private Internet Access works in China: Fast, multi-gigabit VPN Tunnel gateways, worldwide, 7 day money back guarantee.
. PureVPN, a VPN provider located in China HongKong, its price is lower compared to the other VPNs. Its Google search introduction: PureVPN is loved by users all over the world. it protects you online with 256-bit encrypted VPN servers strategically deployed in over 140 countries. The New York Times and Mashable are also its customers. PureVPN works in China: easy-to-use apps, ultra-fast connection, no logs & 7-days money-back guarantee.
. hide me vpn, it also provide free vpn(2 G free per month), its most advantage is Zero personal data.
. other paid VPNs, I am testing the other paid VPNs to see whether they will works perfectly in China, I will add their names in this page when I know them really works in China mainland. How do I use these VPNs? Using the VPN I listed is very simple, just download and install the APP on your devices, log in your account, connect the APP, then you will be able to visit Google.com，Gmail，facebook，youtube，instagram，github and other websites blocked by the GFW in China.